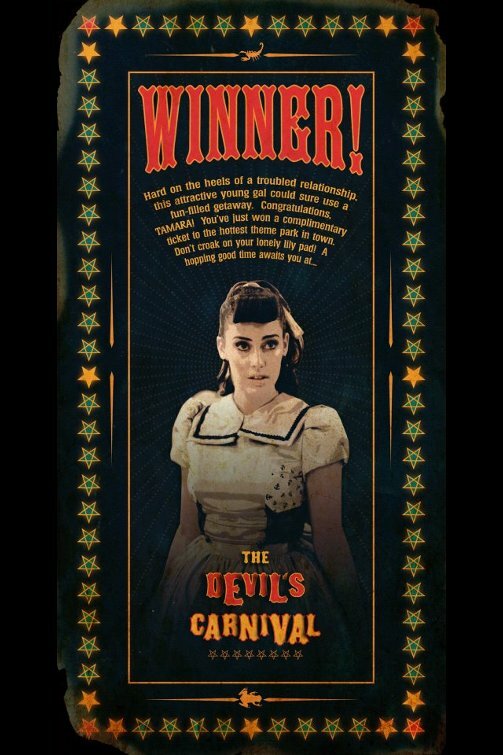 The Devil's Carnival focuses around three individuals that have somehow found their way to a carnival set in Hell that's run by the Devil. The trio is made up of a kleptomaniac, a heartbroken teenager, and an obsessed father, all of whom are doomed to repeat the very sins that delivered them to the carnival's doorstep. Filming for Devil's Carnival wrapped in mid January and is currently in post production, with Noise Creep reporting that Slipknot's Shawn Crahan would be participating in his first acting role. A film trailer featuring singer Emilie Autumn was released in late December of 2011. The Hollywood Reporter quotes Bousman as saying that the movie is "more accessible than Repo but also a lot darker than Repo" and that Devil's Carnival will be receiving a 30+ city road tour and a 12 song album. The 2012 release has been referred to as "episode 1" by its creators, with Autumn confirming that episode 2 was currently being written.